From bold, vibrant colors to soft pastels; from photography series to installation pieces, the new art exhibits featuring work from outside artists use a diverse range of media and subject matter. Roomiani’s work focuses on nature with objects such as leaves, gems and fungi depicted in vibrant, psychedelic colors. The exhibit displays digital collages, resin sculpture and installation pieces. Roomiani collects specimens from around her neighborhood and carefully arranges them inside tubes and jars displayed on shelves. She also uses digital photography, creating collages from her photos of nature, then manipulating the image and altering the colors to make them more vivid. “[I inspect] specific items, and then that inspires a piece,” Roomiani said. Roomiani also has a series of rock-like objects that appear to be natural, but she actually makes them herself. “I had to carve original objects, then make a mold and then pour the resin in it, mix it all up, add different colors, and then I went in and manipulated some of it,” Roomiani said. Roomiani’s favorite project was her natural botanical dye prints. The prints are dark and look like galaxies, colors expanding and bleeding onto one another. Roomiani earned a Bachelor of Fine Arts from the University of North Texas as well as a business degree. She works as a professional printmaker and illustrator. Donjuan’s series “Just Be” features paintings, photography and sculpture. The work on display depicts masked people to represent a feeling of alienation, he said. Many of Donjuan’s pieces are untitled, including a large white headdress. 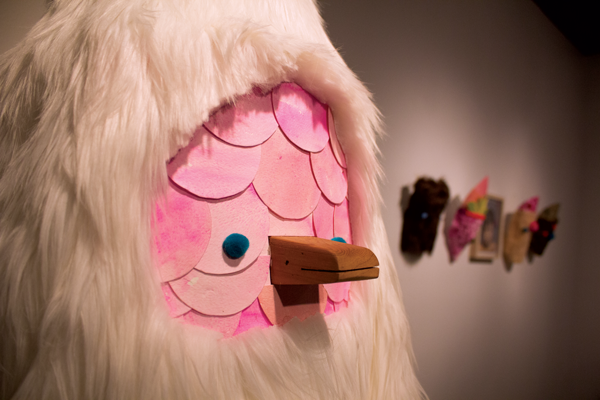 The mask is enormous, white and furry with a pink, scaly face and tiny blue pom-poms for eyes. He believes his artwork will resonate with people, especially if they have ever felt like they don’t belong. Donjuan earned a Master of Fine Arts from the University of Texas in San Antonio. He teaches painting and drawing at UT-Arlington and El Centro. The subjects in most of Donjuan’s paintings and photographs are people he has a personal relationship with. However, he used some of his students as models for the “Just Be” photo series. Iris Bechtol, Eastfield’s gallery coordinator, believes the exhibits will inspire students to use a variety of media. “The diversity of materials that each artist is exhibiting is really great for the students,” she said. Seeing successful artists working in a variety of media can help students with their own art projects, Bechtol said. “It’s really interesting for two very diverse bodies of art opening at the same time,” she said. Nofaly Celestino observes ‘Green Wall’ from ‘Botanica Spectrum.’ Photo by Jesus Ayala/The Et Cetera. Shamsy Roomiani’s ‘Botanica Spectrum’ takes a the artist’s deep connection from nature and is “part scientific documentation and part reinvention of the natural world.” Photo by David Sanchez/The Et Cetera.